Seeing a Killer Whale surfing behind a whale watching boat is an extremely unique sight. The whales know they can use the pull of the boats to move to another location quickly and efficiently. 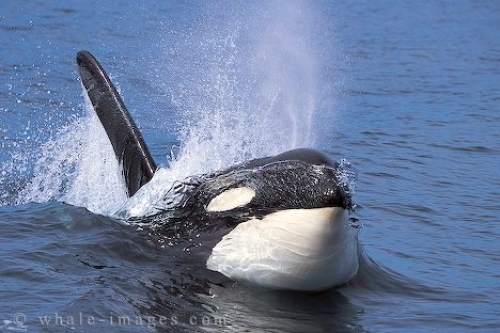 A surfing killer whale is a powerful sight to behold. In this picture I've captured the motion and speed of this mythical creature with the water breaking over his face, and the exhale of his breath, so much energy is portrayed here in a split second. Picture of a large Killer Whale male traveling at high speed - a Mythical Creature in action, Vancouver Island, Canada.